The five-day event brought together GEO member countries and organizations, as well as scientists and stakeholders from across the world to debate the next decade for GEO, and to discuss the latest developments in Earth Observation technologies and applications. 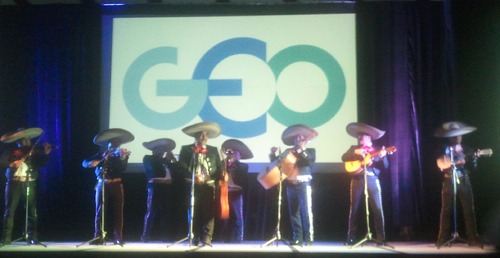 The GEO-XII Plenary approved the GEO Strategic Plan 2016-2025, and the Summit endorsed a Mexico City Declaration (see: http://www.earthobservations.org/geo12.php). EU BON participated at GEO-XII and was represented at the European Commission Stand "Europe for GEOSS" with a poster and a short video clip. A real highlight was the visit by the European Commissioner for Research, Science and Innovation, Carlos Moedas. During his short visit, the Commissioner took specific interest in the project and spent some time discussing EU BON's relevance with the coordinator and his staff. EU BON was also presented during a dedicated side event entitled "The GEO Biodiversity Observation Network (GEO BON): Enhancing Biodiversity Observations and Products for User Needs". The project’s key products were introduced by the project coordinator Christoph Häuser and the workpackage 2 leader Hannu Saarenmaa. From 9 to 11 November in Vienna, Austria the EU H2020 project Detecting changes in essential ecosystem and biodiversity properties – towards a Biosphere Atmosphere Change Index: BACI has organised a special workshop titled "Remote sensing applications related to land use/change" with the aim to facilitate co-design and co-production of knowledge with regard to innovative applications of remote sensing products. EU BON project partner Duccio Rocchini was among the invited lecturers at the event. His talk titled "Like in a Rubik’s cube: Recomposing Biodiversity Information by Remote Sensing Data" introduced some experience from EU BON. The overarching objective of BACI is to tap into the unrealized potential of existing and scheduled space-borne Earth observation data streams to detect changes in ecosystem functioning and services that have repercussions for essential biodiversity variables, land use potentials, and land-atmosphere interactions. The ASEAN Centre for Biodiversity (ACB) marked its 10th year with the theme, "ACB and ASEAN Member States: A Decade of Cooperation on Biodiversity Conservation." The celebration covered a number of activities on 2 October 2015 at the College of Forestry and Natural Resources, University of the Philippines, Los Banos, Philippines. These included the groundbreaking ceremony of the new ACB headquarters; Tree Growing Activity at the "Tree World"; awarding of the Zooming in on Biodiversity Photo Contest Winners; and "Nawa'y Muli Tayong Makauwi," a musical theatre show on biodiversity conservation. The event provided ACB with an opportunity to promote the milestones of the Centre, and a venue for the ASEAN Member States, ACB and its partner organizations and countries to get together and further strengthen collaborations and reaffirm commitments to conserve the rich biodiversity of the ASEAN region. Find more updates in the latest ASEAN Biodiversity Bulletin. Check out the Expert-in-training programme enabling trainees to develop and strengthen their taxonomic research skills through on-the-job-training and the Modern Taxonomy programme offering intensive theoretical courses in various subjects. The Distributed European School of Taxonomy (DEST) was established within the framework of the EU funded project European Distributed Institute of Taxonomy (EDIT) and under the umbrella of the Consortium of European Taxonomic Facilities (CETAF). The EDIT consortium agreement lasted from March 2006 until March 2011. Since then, the Royal Belgian Institute of Natural Sciences (RBINS) remains responsible for the continued management of DEST, organization of courses and related logistical matters. The DEST currently includes a network of around 100 training providers from 60 institutions. MUSE, or the Science Museum is an auxiliary body of the Autonomous Province of Trento. Its task is to interpret nature, starting from the mountains, using the eyes, tools, and applications of scientific research, taking advantage of the challenges of the contemporary world, stimulating scientific curiosity and the pleasure of knowledge, giving value to science, innovation, and sustainability. We look forward to more institutions and projects joining our Associated Partners family. It also presents the two core activities of GEO BON: the development of the Essential Biodiversity Variables framework and of the Bon-in-a-Box toolkit. The different national, regional and thematic biodiversity observation networks associated with GEO BON are presented. The report highlights the most important activities from each of the nine working groups of GEO BON, where experts around the world work around specific biodiversity monitoring topics. The publication titled "Investing in European success – A Decade of Success in Earth Observation Research and Innovation" looks at the benefits that Earth Observation brings to studying and protecting the environment. The Earth’s atmosphere, oceans and landscapes are changing rapidly, with human activities being a major driver. Monitoring and modelling these changes are critical because they allow governments, society and the private sector to make informed decisions about climate, energy, food security, natural hazards, health and other societal challenges. To be effective, these responses must be grounded in comprehensive and timely information. More importantly, decision makers, managers and experts must have access to the information they need, when they need it and in a format which can be easily utilised. To address this challenge, the intergovernmental Group on Earth Observations (GEO) has provided a voluntary framework since 2005 where 98 governments, the European Commission and 87 international organisations develop new projects and coordinate their strategies and investments in the field of Earth observation. The vision of GEO is to realise a future wherein decisions and actions for the benefit of humankind are informed by coordinated, comprehensive and sustained Earth observations and information. GEO’s main objective is to develop and implement the Global Earth Observation System of Systems (GEOSS). EU BON is an attempt to overcome these problems at European level and to contribute to the Group on Earth Observations’ (GEO) global initiative with the same aims – GEO BON. Find the full publication here, EU BON can be found featured on pages 26 - 27. Post-doctoral scientist position is open for the project "Towards an integrated prediction of Land & Sea Responses to global change in the Mediterranean Basin" (LaSeR-Med), which focusses on integrated socio-ecological modelling. The duration of the contract is initially one year, with a possible extension for a second year, depending on the initial results. The post-doc will be based within the Mediterranean Institute of marine and terrestrial Biodiversity and Ecology (IMBE) in Aix-en-Provence, France. The project is part of the Labex OT-Med (http://www.otmed.fr/). Applicants should hold a doctoral degree in physics, chemistry, microbiology, geosciences, environmental sciences or a related field of science. They should be familiar with modelling biogeochemical interactions between ecosystems and capable to further develop existing numerical ecosystem models. Programming skills (C) and modelling experience are therefore mandatory. Knowledge of R and of Unix/Linux environment will be an advantage. The candidate should have good written and oral communication skills. For work, good skills in the English language will be essential. Terrestrial and marine ecosystems are connected through groundwater, river discharge and nutrient outflows (especially N and P). River catchments in the Mediterranean are N-intensive regions, mostly due to intensive agriculture in the North and to crop N2 fixation or food & feed import in the South. The fraction of nutrient reaching the sea constitutes significant anthropogenic forcing of many marine biological processes. For simulating the dynamics of the first levels of the marine food web (from nutrients to jellyfishes), the ocean biogeochemical model, Eco3M-MED, used and developed by the Mediterranean Institute of Oceanography (MIO) within OT-Med, currently uses N and P measurements at river mouths, e.g. for the Rhône. In order to estimate the impacts of global change on the functioning of marine ecosystems, the project aims at modeling the dependency of N and P outflows to the Mediterreanean sea toward land management. Land management is modelled as part of the agro-ecosystem model LPJmL (Bondeau et al., 2007), that has been especially adapted to the Mediterranean cropping systems (Fader et al., 2015). Among others, LPJmL simulates the daily carbon and water cycles, and the river discharges to the sea. Following existing approaches in the scientific literature, the post-doc will implement the nutrient N and P transfer in LPJmL, covering the net nutrient inputs to the river catchments by accounting for the processes occurring at the agro-ecosystem level (N2 biological fixation, fertilization, atmospheric deposition) and the net food and feed imports. Since only a minor fraction of the net nutrient inputs from Mediterranean basins reaches the sea, the retention along the nutrient cascade will have to be added to the LPJmL river routing scheme, similarly to the method used by the Riverstrahler model. Once the nutrient transfers have been introduced into LPJmL, simulations will be validated using current climate and land use forcing for comparisons with the existing observations from river outlets. Finally, future conditions will be assessed by using the model with scenarios of changing regional climate and land use / land management. Applications should contain a suitable motivation letter describing your anticipated role in the project, a CV, a list of scientific publications and the names of at least two scientists that can be contacted for references. They must be sent to Ms. Gabriela Boéri (gabriela.boeri@imbe.fr). Please prepare your application as a single file in pdf-format. Questions about the project or the position can be directed to Dr. Alberte Bondeau (alberte.bondeau@imbe.fr). The position will be filled as soon as a suitable candidate has been found – work should start soon after that date. The salary and contract conditions will be determined according to standards set by Aix-Marseille University – questions in this regard can be directed to Sophie Pekar (pekar@otmed.fr). First, stakeholders were asked, which indicators provided best "value for money" for their purpose. Habitat, plant species and farm management indicators ranked highest. Wild bees, earthworms and spiders as important providers of ecosystem services came next. Together they form a minimum set of indicators which provides non-redundant information and which can make dominant changes in farmland biodiversity visible. Researchers from the FP7 funded EU projects "Biodiversity Indicators for European Farming Systems (BioBio)" and "Building the European Biodiversity Observation Network (EU BON)", then developed cost estimates for nine monitoring scenarios and the authors conclude that a continent-wide farmland biodiversity monitoring scheme would require only a modest share of the Common Agricultural Policy (CAP) budget (2014-2020). Cost assessments showed that the farmland biodiversity monitoring scenarios require 0·01% - 0·74% of the total CAP budget and 0·04% - 2·48% of the CAP budget specifically allocated to environmental targets. With 30% of the CAP devoted to environmental targets (more than 120 billion EURO), investing in a monitoring process seems a logical choice given these results. The researchers provide a framework for individual countries to start farmland biodiversity monitoring, building towards a coherent European picture. The studies were published in the Journal of Applied Ecology and the Journal of Environmental Management. "Despite scientific proof that monitoring increases the (cost) efficiency of policy measures, monitoring rarely gets included in policy programme budgets. We identified that the cost are not as high as feared. To further facilitate implementation, the study provides stepping stones to build a European monitoring scheme, offering a choice in indicators and using regions as a unit of trend analysis," explains Dr. Ilse Geijzendorffer, the lead author of the Journal of Applied Ecology paper. S. Targetti, F. Herzog, I.R. Geijzendorffer, P. Pointereau, D. Viaggi, Relating costs to the user value of farmland biodiversity measurements, Journal of Environmental Management, Volume 165, 1 January 2016, Pages 286-297, ISSN 0301-4797, http://dx.doi.org/10.1016/j.jenvman.2015.08.044. The 1st GLOBAQUA International Conference will be held on 11-12 January 2016 in Freising, Germany. The interdisciplinary conference will go under the motto "Managing The Effects Of Multiple Stressors On Aquatic Ecosystems Under Water Scarcity". The conference will serve as a platform for exchange and discus­sion of innovative scientific findings and methods in aquatic ecosys­tems research. It will focus on novel methods of environmental monitor­ing and modeling of various scopes, scales and structural complexity to improve process understanding the interconnectivity and feedback mechanisms of climate (regional), land use (regional), economy, hydrol­ogy and hydraulics (catchment and river), water quality (river), biology and aquatic ecosystems (reach scale). Further, the conference builds the bridge to the scientific assessment of implications on policy and management. The deadine for submitting an abstract for the conference has been now extended until 7 Nov 2015. More information on the conference, registration, abstract submitting is available on the GLOBAQUA website. Substantial amount of documented occurrence records is awaiting publication stored in repositories and data indexing platforms, such as the Global Biodiversity Information Facility (GBIF), Barcode of Life Data Systems (BOLD Systems), or Integrated Digitized Biocollections (iDigBio). In order to streamline the authoring process, save taxonomists time, and provide a workflow for peer-review and quality checks, Pensoft has introduced an innovative feature that makes it possible to easily import occurrence records into a taxonomic manuscript. Prior to this development, Pensoft's ARPHA Writing Tool (AWT) only used the "upload from Excel" approach for this workflow. Although this method significantly simplified the process of importing materials and is actively used by the authors, it still required one extra transposition step. Now, we added a new even more user-friendly option. By simply specifying an identifier (ID) in the relevant box, the new import plugin allows for occurrence data, stored at GBIF, BOLD systems, or iDigBio, to be be directly inserted into the manuscript. It all happens in the user-friendly environment of the AWT, where the imported data can be then edited before submission to the Biodiversity Data Journal. Not having to retype or copy/paste species occurrence records, the authors save a lot of efforts. Moreover, they automatically import them in a structured Darwin Core format, which can be easily downloaded from the article text into structured data by anyone who needs the data for reuse after publication. Another important aspect of the workflow is that it will serve as a platform for peer-review, publication and curation of raw data, that is of unpublished individual data records coming from collections or observations stored at GBIF, BOLD and iDigBio. The work has been partially supported by the EC-FP7 EU BON project (ENV 308454, Building the European Biodiversity Observation Network) and the ITN Horizon 2020 project BIG4(Biosystematics, informatics and genomics of the big 4 insect groups: training tomorrow's researchers and entrepreneurs), under Marie Sklodovska-Curie grant agreement No. 542241. The Royal Museum for Central Africa (RMCA) in Tervuren (Belgium) is part of the FishBase Consortium and responsible for the information on the fresh- and brackish water fishes of Africa in the FishBase database. Through an agreement with the Belgian Development Cooperation and as part of the FishBase program, the RMCA has five (5) grants available for a 3-month training program in the use of FishBase and the taxonomy of African fishes. This course has been offered annually since 2005 and is held at the Royal Museum for Central Africa (Leuvensesteenweg 13, B-3080 Tervuren, Belgium). For more information and to apply for this three-month training grant, see: http://fishbase.africamuseum.be or www.fishbaseforafrica.org. Please note that for 2016, this course will be given in French only. The ideal host institution works on scientific issues related to biodiversity, ecosystem services and human well-being, at various scales from local or national to global; and meets a few practical specifications via direct funding or in-kind support for establishment of a fully operational office. Expressions of interest need to be sent to Karine Payet-Lebourges by email with subject "ecoSERVICES IPO – Offer". Applications will be examined with the scientific steering committee on the week of 30 November 2015. Pensoft has currently implemented the feature for biodiversity, ecological and environmental data. Such records are either published through GBIF or deposited at DataONE, from where the associated metadata can be converted directly into data paper manuscripts within the ARPHA Writing Tool, where the authors may edit and finalize it in collaboration with co-authors and peers and submit it to the Biodiversity Data Journal (BDJ) with another click. Until now, the GBIF metadata have been exported into an RTF file. The new feature will be also part of future Pensoft projects, including the recently announced Research Ideas & Outcomes (RIO) Journaland the forthcoming Ecology and Sustainability Data Journal. Looked down on with scepticism by many taxonomists, handling big data efficiently is a huge challenge that can only be met with thorough and multi-layered efforts from both scientists and technological developers. Projects like the Pan-European Species-directories Infrastructure (PESI), started in 2009, prove that harmonised taxonomic reference systems and high-quality data sets are possible through dynamic, expertly created and managed online tools. The methods, results and future prospects of PESI are available in the open access Biodiversity Data Journal. PESI results will also feed as an essential part for the advancement of relevant EU projects, such as Building the European Biodiversity Observation Network (EU BON). In the EU BON project, the PESI Backbone will be advanced to satisfy the needs of the GEO BON / GEOSS system, also serving as a taxonomic backbone for the projected EU BON Biodiversity Portal. Aiming at standardisation and integration of taxonomic data across platforms PESI also works in close collaboration with other relevant projects including GBIF, LifeWatch, the Catalogue of Life, the Encyclopedia of Life, the Global Names Architecture, GÉANT, ViBRANT, OpenUp!,BioVeL, iMarine , EU BON and BiodiversityKnowledge . "Scientific names are key carriers of biodiversity information. Therefore, for the efficient exploring and integration of biodiversity data, the development of a functional taxonomic resolution system, including the establishment of a shared taxonomic standard (as a core component), is essential for all sorts of biodiversity assessments. PESI provides such an infrastructure for Europe, integrating the relevant technical (informatics) and social (knowledge & users) networks into a common work program, serving a wide community of biodiversity workers," says Dr. Yde de Jong, coordinator of the Pan-European Species-directories Infrastructure (PESI) project. "The PESI Taxonomic Backbone serves as a taxonomic data standard resource, facilitating and optimising the integration and sharing of European biodiversity data, supporting a wide range of European services, major biodiversity programs and stakeholders on nature conservation and biodiversity management," conclude their results the scientists. The Pan-European Species-directories Infrastructure (PESI) provides standardised and authoritative taxonomic information by integrating and securing Europe's taxonomically authoritative species name registers and nomenclators (name databases) and associated expert(ise) networks that underpin the management of biodiversity in Europe. PESI kicked-off as an EC-FP7 project, running from 2009 to 2011. PESI proceeded from the EC-FP6 Networks of Excellence EDIT, on developing a European Distributed Institute of Taxonomy, and MarBEF, on Marine Biodiversity and Ecosystem Functioning. Building the European Biodiversity Observation Network (EU BON) is a European research project, financed by the 7th EU framework programme for research and development (FP7). EU BON seeks ways to better integrate biodiversity information and implement into policy and decision-making of biodiversity monitoring and management in the EU. A new paper in the Biodiversity journal uses the European Biodiversity Observation Network (EU BON) as an example, to explain how they can fill in gaps and address existing barriers in knowledge through implementing an integrated biodiversity information framework. Biodiversity supports essential ecosystem services that are key to human well-being. The ongoing global biodiversity decline is a threat to humans, particularly in developing countries. The Aichi biodiversity targets of the United Nations' Strategic Plan for Biodiversity set ambitious goals for protecting biodiversity from further decline, but gaps in knowledge still sit in the way of monitoring progress, hindering the assessment of the current status and future trends of biodiversity. There is an urgent need for a paradigm shift with regards to how biodiversity data are collected, stored, shared and streamlined in order to tackle many sustainable development challenges ahead. Solving issues of biodiversity knowledge gaps and data reuse are a main focus of the EU BON project and provide a European contribution to GEO (Group on Earth Observations) and the wider Global Earth Observation System of Systems (GEOSS). The EU BON project aims at addressing the need for a shift towards an integrative biodiversity information framework, starting from collection to the final interpretation and packaging of data. At the centre of the EU BON's efforts is promoting and adopting existing standards of good practice and integrating data within a single biodiversity portal in order to make it discoverable, accessible and digestible. The aim of the portal is to collect and standardize existing data sources, as well as to work towards translating and visualizing the collected raw data to show trends and prognoses useful to policy and society. "Biodiversity data, information and knowledge are diverse, dispersed and disparate. It is hard for a non-specialist to make sense of raw data and often separate data sets and gaps in data prevent effective policy reporting. This is why progress towards the Aichi targets is often hard to calculate, and where BONs can play a central role by working towards standardization to achieve true interoperability of data sets." explains the lead author Dr. Florian T. Wetzel,Museum für Naturkunde (MfN), Berlin. "For advancing with the biodiversity challenge and the Aichi Targets globally, regional BONs are needed, and this is where EU BON attempts to make a difference for Europe" adds Dr. Christoph L. Häuser, EU BON coordinator and Deputy Director General at MfN, Berlin. EU BON partners, Annapaola Rizzoli and Duccio Rocchini give a TEDx talk on extreme biodiversity in space and time at 2200 metres in the Pale di San Martino on September 6, organized by TEDxTrento (soon will be also available with English subtitles).